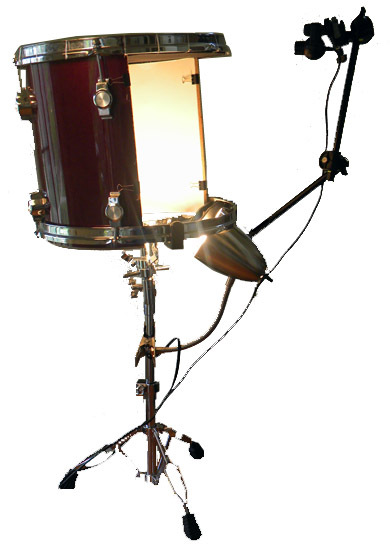 In this series of posts I will try to explain in as much detail as possible how to build a Silent Drum. The Silent Drum is an open source instrument and the code for pix_drum is released under the GPL license. This instrument is developed in the Pd or Pure Data and GEM environments. Links to software that is needed are provided along the tutorial. All patches and code are designed to work “out of the box” provided you have a copy of Pd and drivers for your camera, without you having to compile the objects. Currently, the only platforms supported are intel macs, os x 10.4 or higher and Linux 86_64 (64 bit). pix_drum is now part of GEM’s extra library, so downloading the current gem will also get you the sources and compiled objects. If you are on Windows, you should be able to get it to work by following Epic Jefferson’s advice. Menno Van der Woude reports developing an OpenFrameworks version. Compositions for the Silent Drum. download the source code and patches for pix_drum. documentation is on the works | bájate el código patches para pix_drum. documentación en proceso. This entry was posted in Recipes | recetas on April 28, 2010 by admin. Is there a tutorial for how to map the sounds?